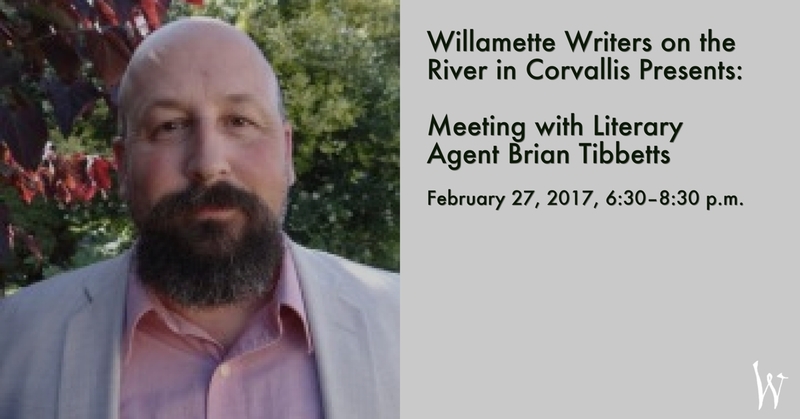 On Monday, February 27, 2017, 6:30–8:30 p.m., join Willamette Writers on the River in Corvallis for a meeting with literary agent Brian Tibbetts. Bring your questions! The meeting will be held at the First Presbyterian Church, Dennis Hall. In this world of e-books, publishing conglomerates, and contracts so unreadable only a lawyer knows what they say, it’s sometimes nice to have a chance to sit and talk about the book business with someone who has broad experience. This is your chance to ask any question you have about writing, publishing, proposals, marketing, and making a living at writing. Join us for an evening of talking books and writing. Twenty-five years freelance writing experience. Board President of the nonprofit Independent Publishing Resource Center in Portland. For his complete bio, see the MacGregor Literary website. Willamette Writers on the River (WWotR) in Corvallis meets on the fourth Monday of the month, 6:30-8:30 p.m. at the First Presbyterian Church. No meetings August. • 6:30 – 6:45 PM — Networking & social time. • 6:45 – 8:15 PM — News & announcements followed by the program. • 8:15 – 8:30 PM — More net¬working & conversing with speaker. Click here to learn more about Willamette Writers on the River (WWotR) in Corvallis.